There was one that Gerber claimed was mac and cheese. Mac and Cheese my arse. It was beige and tasted like paper that had been marinated in mud, so I guessed that it was rice. You should have seen the frowns on our faces when we tasted some of these "foods". Hilarious. How can we feed our babies this crap? This was definitely torture. Babies of the world, please forgive us. Until now, I don't think that anyone has spoken out about this injustice. I think that I should call the People for the Ethical Treatment of Babies, PETB, a division of PETA, on the Gerber baby food company. They'll get together and throw red paint on the jars of food on the grocery store shelves. One of my coworkers likes the Republic so much that he wanted me to make one to fit his two year old daughter. 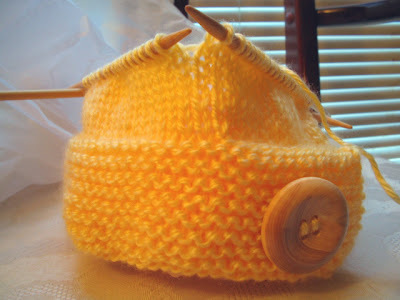 He picked out this yarn by TLC because it was bright yellow, like the sun. Which is fitting because "Sun" is the first part of his last name. The button is 1.5" and I'm loving the hat already. I should be done with it tonight. You guys have a Happy Thanksgiving, ok? I'm spending it with Snookums and his parents.